In the latest in a long string of lawsuits filled against fracking operations, a Texas family is claiming damages after the water well on their property exploded. The family’s ranch is located just 1000 yards away from two fracking drills, which likely leaked methane to the groundwater according to the lawyer representing the family. The explosion left Cody Murray, the 38-year-old husband of the family of four, with severe burns on his arms, upper back, neck, forehead and nose along with “significant neurological damage.” He is now permanently disfigured, disabled and cannot work. He is now asking the court for restitution. 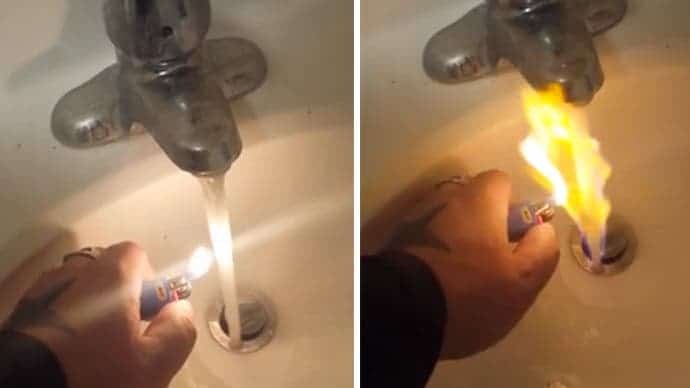 A video made by a man from North Dakota shows him cautiously holding a lighter up against the stream of water coming out of his tap, prompting large flames to rise up into the faucet. Various homes around the United States have raised flags along the years to authorities showing how their groundwater got contaminated by nearby fracking sites. The event happened almost a year ago, on August 2, 2014, when Cody and his father rushed to the water well on their ranch in Perrin, Texas, alarmed by pressurized water spraying inside. “At the flip of the switch, Cody heard a ‘whooshing’ sound, which he instantly recognized from his work in the oil and gas industry, and instinctively picked his father up and physically threw him back and away from the entryway to the pump house,” the complaint states. According to the lawyer representing the Murrays, isotope analysis revealed that the methane leaked into the well was not naturally occurring and is sourced from the nearby drilling activities. Previously, another Texas family sued after flammable water came out of their kitchen tap. In another instance, yet again a family from Texas, was awarded $3 million in damages after fracking operations near their 40-acre ranch left them suffering severe health side-effects. Elsewhere, in Canada, Bruce Jack’s water well at Spirit River was contaminated with dangerous levels of methane and ethane after nearby drilling and hydraulic fracturing. For three years Jack had be trying to get regulators to come to his property and investigate the matter. Ironically, in 2006, Bruce Jack and two industry gas-in-water testers, were seriously injured and hospitalized when the contaminated water well exploded. The shale boom has been credited with revitalizing the oil and gas industry in the States. However, the downside is that it’s all being done in a hurry. For instance, in Wisconsin, 40% of drillers don’t adhere to the environmental rules. Pressed by time and lower profit margins, drillers often make a sloppy job. This can lead to cases such as these with methane leaking in the groundwater, and in some cases arsenic. Nevermind the earthquakes, and the largely unknown long-term environmental impact of fracking. Before shale runs out, more families will undoubtedly pay the ultimate price for corporate negligence.